IITA Deputy Director General, Partnerships for Delivery (DDG-P4D), Kenton Dashiell, embarked on a two-day tour of IITA’s Eastern Africa hub in Dar es Salaam, Tanzania on 1–2 November. During the visit, he met the staff, Tanzania Youth Agripreneurs, and partners. Visiting a lab at TARI-Kibaha nematology lab. At the end of the visit, Dashiell said he was very impressed with the warm welcome he received from the team and with the ongoing research activities, which are contributing to IITA’s vision of alleviating poverty and rehabilitating degraded lands. During his visit, he was received and accompanied by the Director for Eastern Africa hub, Victor Manyong; the Head of Advocacy and Resource Mobilization, Regina Kapinga; TAAT Cassava Compact leader Adebayo Abass; and Head of Finance and Administration, Eveline Odiambo, among other key staff at the hub. 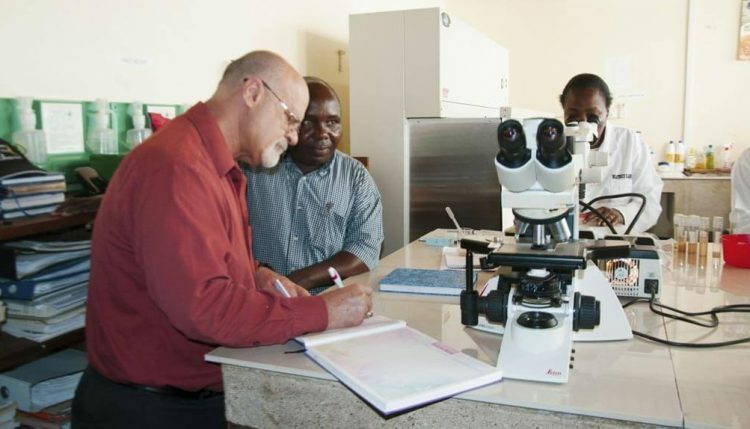 Dashiell led the hub in officially welcoming Dr Geoffrey Mkamilo, the Director General of the newly created Tanzania Agriculture Research Institute (TARI) to IITA. Poster exhibition – scientists at the hub explaining their work to the DDG and TARI DG. Dashiell noted that IITA had enjoyed a long and fruitful relationship with the Department of Research and Development under the Ministry of Agriculture and now that it had been converted into an institution of its own, TARI, IITA hopes it will continue to enjoy the same close relationship to address major challenges of agriculture in the country and even beyond. In his response, Mkamilo stated that TARI was created as an independent body by an Act of Parliament in 2016 to enhance agricultural research in the country through effective coordination, governance, management, and conducting of agricultural research activities and to provide for other related matters. “We have many partners and are working with many CGIAR centers. However, IITA is one of the most important partners and we are looking forward to your support and collaboration as we deliver on our mandate,” Mkamilo said. During the session, Manyong gave an overview of IITA in the Eastern Africa hub and the collaborative activities between the Institute and TARI, while Mkamilo presented on the new TARI—its mandate, structure, and plans. Many similarities and opportunities for collaboration were identified. The hub had also organized a poster exhibition to allow the DDG and TARI DG to interact with staff and get a better grasp of the research going on at the Institute. The Youth Agripreneurs are close to the DDG’s heart and naturally a visit to the Tanzania Youth Agripreneurs Youth Centre for Excellence at Kwember, 25 kilometers from Dar es Salaam where the youth are engaged in running various agribusinesses, was part of his program. Ken Dashiell listening to the Veronica Kebwe, the Enable Youth Coordinator in Tanzania explaining the youth’s rabbit keeping project. He is accompanied the hub Director Victor Manyong. These agribusiness initiatives include processing of cassava into branded cassava flour ‘Mpishi Mkuu’ (great cook); keeping chicken, rabbit, and fish; and production of chicken feed including growing azolla, a fast-growing water fern that is nutritious for poultry, livestock, and fish. The DDG also met the youth who had graduated from the program and had received support from the African Development Bank (AfDB) under the ENABLE Youth program to set up their activities, and toured the farm and agribusinesses of one such agripreneur, Christa Muzanila. The DDG also met with the staff at the hub to brief them on new developments in the P4D Directorate. He also visited TARI-Kibaha—one of the centers of TARI formerly known as the Sugarcane Research Institute and an important partner for IITA research on cassava. He also visited Kilimorgano, a private tissue culture laboratory, that is partnering with the Institute on rapid multiplication of cassava and banana. The company will also be engaged in the Semi-Autotrophic Hydroponics (SAH) technology for rapid multiplication of cassava seeds under the TAAT Cassava compact. 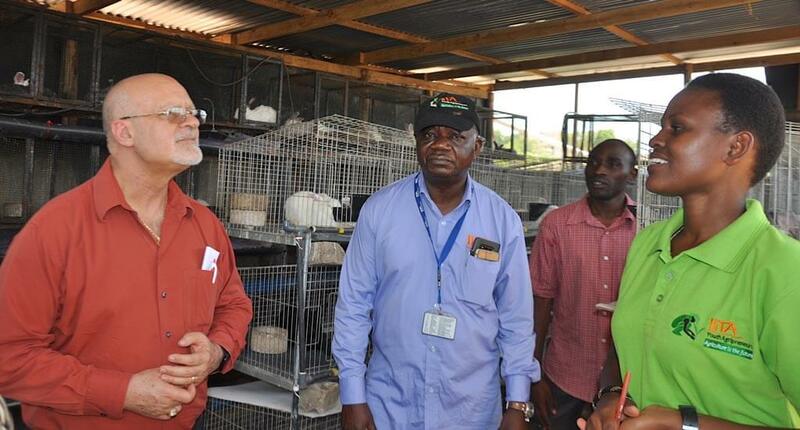 Staff of the company had received training at IITA-Ibadan, Nigeria, earlier this year.